If there was one book that I would recommend for people interested in Arran and its birds, it would have to be the Arran Bird Atlas 2007-2012 published by the Arran Natural History Society. This was based on five years field work involving over seven hundred people submitting over 36,000 records on one hundred and seventy-seven species. In the one hundred and sixty-eight page publication there are more than four hundred maps and more than two hundred photographs. This is available from outlets throughout the island for only £8.00, thanks to financial support from the Arran Trust and two other birding organisations. There are a number of historical publications on the birds on Arran including, “Birds of Arran” written by Robert Gray in 1872 published by Bell and Bain of Glasgow and “The Birds of the Island of Arran” written by J.A. Gibson in 1956 published by Bute Newspapers Limited. 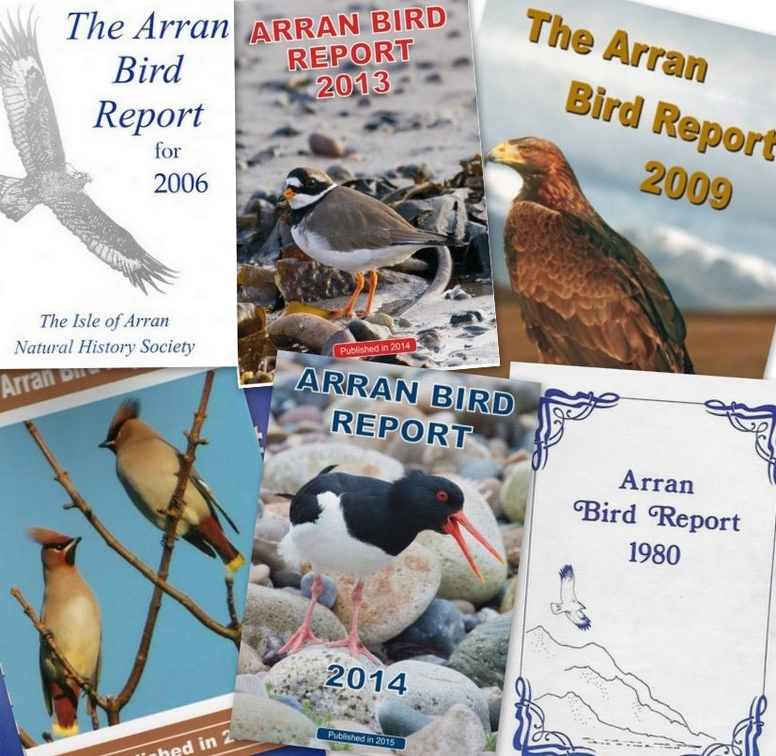 While historical publications are interesting, Arran bird records are sparse until the Arran Natural History Society published its first annual Arran Bird Report in 1978. These reports provide a unique record of the bird life of this special island over the last thirty plus years. All are available at the archives section of the Isle of Arran Heritage Museum and more recent ones are available as a free download. In 2006, the responsibility for writing the annual Arran bird report fell to me. To do this effectively I appreciate that I require the support of a great many people. I have been encouraged that in 2015 to date, I have received almost 9,000 bird sightings from around three hundred contributors. Some of these contributors are residents and some are visitors. All share an interest in the birds of Arran. Their sightings will form the basis of the “Arran Bird Report 2015”. This is an end of year prompt to encourage all “Banner” readers to share their Arran bird sightings with me. All contributions are welcome. I am not just interested in rare or unusual birds, but common birds: where there are significant numbers of common birds, which birds come to the garden at different times of the year, where breeding birds have been seen, when our summer or winter visitors have arrived or departed, and what sightings have given individuals particular pleasure. I know that a number of people keep for their own interest, all sorts of bird notes and I would encourage these people to share this information with me, so that the basis of our annual Arran Bird Report can be as comprehensive as possible.